Thanks for all the great feedback on Dave’s WorkPuzzle earlier this week. It’s always helpful to see what resonates with you. As it turns out, you’re not alone. Reading the press on Amazon this week, you’ve probably noticed this topic (the idea of humans flourishing at work) has broad interest in our culture, and it seems to be emotionally charged. Businesses can and should be used as a means to enable human flourishing. When they’re not, something feels wrong. And as Amazon found out this week, it’s a powerful way of thinking that reaches beyond the walls of the company. 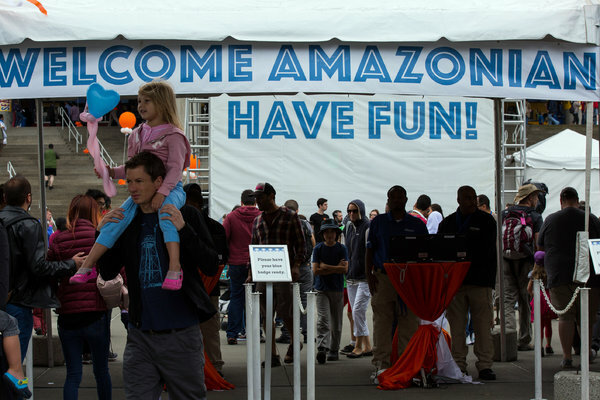 Since our company is located in the Seattle metro area, Amazon has been part of our community’s employment dialog for more than 20 years. While the New York Times Article is critical of the Amazon work culture, the reality of working there is more complex. I have friends who work at Amazon and love it. Other friends are former Amazon employees and left for some of the reasons highlighted in the NYT. No doubt, there’s truth to what was written. However, it was composed in a way to produce a certain level of shock. Further debating what the culture of Amazon is really like seems like a waste of time. It’s more interesting to observe the public’s reaction to what was written. In Amazon warehouses, employees are monitored by sophisticated electronic systems to ensure they are packing enough boxes every hour. (Amazon came under fire in 2011 when workers in an eastern Pennsylvania warehouse toiled in more than 100-degree heat with ambulances waiting outside, taking away laborers as they fell. Amazon may be singular but perhaps not quite as peculiar as it claims. It has just been quicker in responding to changes that the rest of the work world is now experiencing: data that allows individual performance to be measured continuously, come-and-go relationships between employers and employees, and global competition in which empires rise and fall overnight. Amazon is in the vanguard of where technology wants to take the modern office: more nimble and more productive, but harsher and less forgiving. There is much more to read, if you care to learn more. Be warned, it’s really long (over 7000 words). Not all NYT articles are given comment privileges. The editors decide which topics are worth discussing. Of those articles having comments, it seems most are below 1000 comments. This Amazon article received nearly 6000 comments! These aren’t just any comments. Unlike most news sites, the NYT proactively moderates their comment sections with human editors to weed out the garbage. To get a comment published, the reader has to add something thoughtful to the conversation. The NYT hit a nerve. A large part of the population cares about human flourishing—especially as it relates to work. They care about their work. They care about how they’re treated at work. They care about how companies treat their employees (including themselves). There is a small voice in our heads telling us work and human flourishing can and should be connected. What do you believe about people? Be ready to engage in this conversation. Questions or Comments? Reply to your WorkPuzzle subscription email. Didn’t get the WorkPuzzle email? Subscribe below. We promise not to share your email with others or use it for any other purpose but delivering WorkPuzzle notices.